Now, here is a practice that modern day African-Americans (or anyone else outside of a liturgical tradition) ain’t havin’. “Hmph! Kissing some preacher’s hand.” Maybe it wouldn’t be the worst obstacle for a black inquirer if the priest looks like Fr. Maximus Cabey or Fr. Jerome Sanderson. Maybe it would be easier in an Ethiopian, or (at least) a Coptic parish where the pastor has some melanin to give him some color. But, for children of Nat Turner, Huey P Newton, and Black Pride; to kiss some white man’s hand is down right blasphemy. On the surface, it seems to do so would be to go back to the days when “massa’s preacher would tell us niggras to be good slaves and come back if we ran away.” I must confess, at first. I had some issues with it in the back of my mind as well. But, let’s think the practice through for a moment. First of all that kissing is a part of Middle Eastern culture and that Christianity comes to us from that part of the world. To this day, it is normal to see men greet each other with a peck on the cheek. No saliva is involved. It is a sign of affection. The Apostle Paul encouraged the Christians in Corinth and Rome to greet one another with a holy kiss (I Cor 16:20, Rom 16:16). The kiss is a sign of fellowship and brotherhood, not subservience. The kiss is a symbol of our participation in repentance and redemption. A wicked woman kissed the feet of our Lord in repentance (Lk 7:38). In the story of the Prodigal Son, the Father runs out to meet the repentant young man and kissed him on the back of his neck (Lk 15:20). Priest and bishops hear our confessions and give advice on overcoming our sins and absolution from them (Jn 20:22, 23; Mat 6:14, 15). 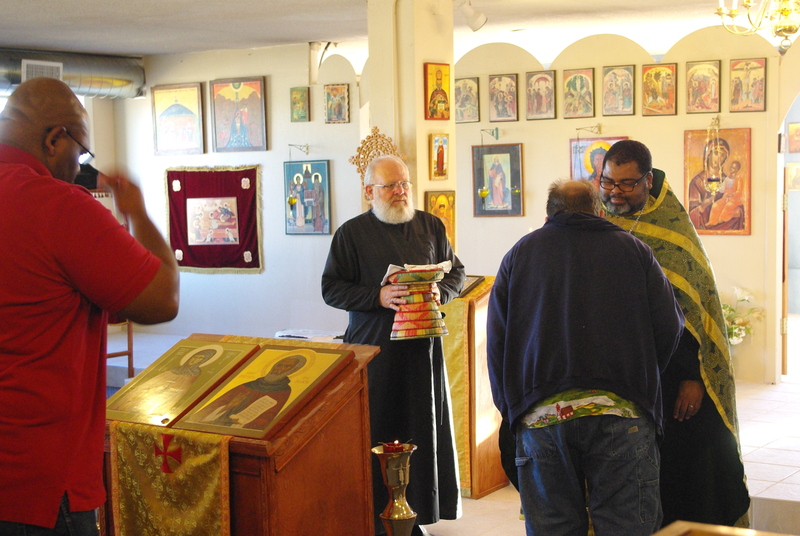 However, at every Divine Liturgy, the presiding cleric ask us to forgive him of his sins before he offers us the Eucharist. So, to offer a kiss to the hand is to give a seal of our forgiveness toward him as well. And during Forgiveness Vespers (the start of Great Lent), everybody kisses everybody. At the time the practice of kissing a bishop’s or priest’s hand developed, it was sometimes a kiss good-bye. For the first 300 years, Christians were persecuted and clergymen were expected to be the first among the martyrs. Bishops Ignatius of Antioch and Polycarp of Smyrna, for example, didn’t accept the offers from their fellow believers to run away or hide from the Romans. These and other clergy and laity alike boldly stated their faith in Jesus Christ and met a variety of tortures and executions. That kiss on the hand was a kiss of farewell in some cases. The modern day clerics understand this history and do not take this gesture lightly. That kiss is a charge to them to live in humility and reverence as their faith may be put to a strenuous test at any time. If the scriptures are true that Jesus said it is better to give that receive (Acts 20:35), then the real burden isn’t on us who kiss the hand of the cleric. The man that receives that kiss has a great, big cross on his shoulders. To get an affectionate and brotherly greeting from friends and relatives is not difficult as we love these people and they love us. The bishop and priest can never be too certain as to who is going to give the “Judas kiss.” Oh yeah, Judas seemed to be alright and never gave any clear indication that he had any ulterior motives. That was until he gave the sign to the officers of which one they were looking for (Mat. 26:48, 49). And the priest has to accept the kiss from that parish council member that he overheard cuss him behind his back for no reason and hadn’t repented of it, the deacon or reader that does not show up at all for Vespers or some other service where he has to pull double duty, and even the woman (or man for that matter) that wants to seduce him and ruin his position in the church. He may or may not know when Judas is going to kiss him. But, the clergyman fulfills his role and accepts the kiss. The hands of the priest or bishop are the hands that prepare, bless, hold, and distribute the most important portion of the Divine Liturgy. Holy Eucharist is the body and blood of Jesus Christ and if we do not partake of it, we have no life in us (Mat. 26:26-28, Jn 6:43-58). The authority to preside over this highest point of Lord’s Day Worship comes through the God-given, man ordained apostolic succession. So, to give a mere lip peck on the hand of one who does this most important sacrament is not unreasonable. I know, I know. We are “Black and Proud. The Original Man is the Black Man, the maker, owner, and cream of the planet Earth, and father of civilization.” Seriously, Jesus humbled himself by taking on flesh and giving His life for our salvation (Phil 2:5-8) and you are too good to kiss the hand of His priest? While we ought to feel comfortable in our own skin and not see our race as subservient to anyone, we should also be aware that pride comes before destruction (Prv. 16:18). We serve a God that brings down the proud and exalts the humble (Mat. 23:12). The tradition is not to grovel at his feet or purchase all of his DVD’s and other products. A mere peck on the hand is what we humbly give to the priest or bishop. That is not humiliating if you consider the biblical, cultural, and historic faith of Orthodoxy. “What if that priest still has some white supremacist prejudice in him?” This is a possibility due to the history of American racism and it’s continuous presence. Now, if the actions and attitudes of the clergyman is proving to be a negative factor in the congregation, the church does have proper channels through the parish council and heirarchs to deal with such people. Other than that, don’t let his foolishness make you fall as well (Mat. 6:43-48). In fact by your doing right, he may be convicted (Rom. 20:12) to change his thinking and ways. Your kiss could help save a soul and a church. 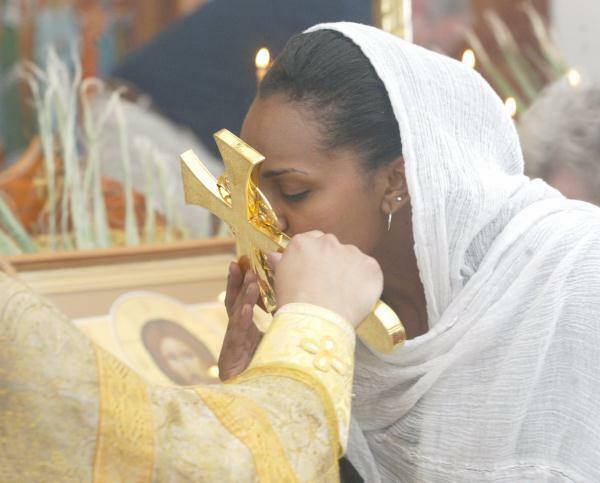 I know and understand how this is an obstacle for African-American inquirers to the Orthodox faith. But, it need not be. Consider the culture and history of the ancient faith and compare if this tradition is rooted in the scriptures. Take your time and talk to your priest.